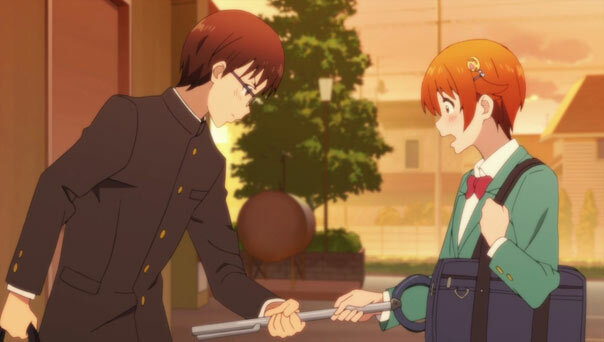 We don’t see the actual moment Mutsuki learns of Kisaragi’s apparent fate, but we do see the immediate aftermath. 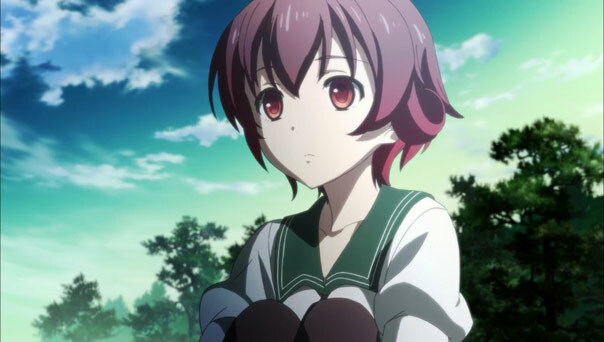 Destroyer focus and morale plummets, and Mutsuki herself is in silent denial, putting her life on hold to spend every free moment at the wharf, waiting for her sister ship to return. But the war must go on. 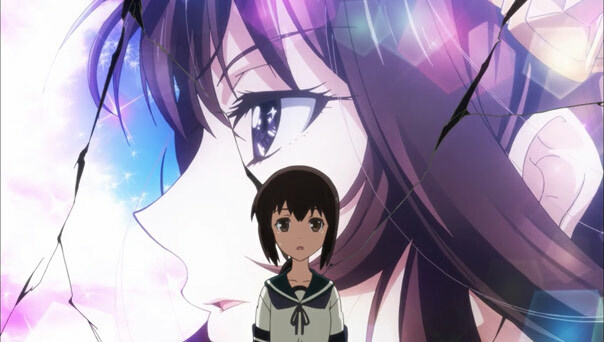 It would probably be best if Mutsuki had a battle to fight to take her mind off Kisaragi, but it’s Fubuki who gets picked to join super-destroyer Shimakaze and the four Kongou-class fast battleships in an attack in the “south-west sea zone.” Dutch East Indies, perhaps? 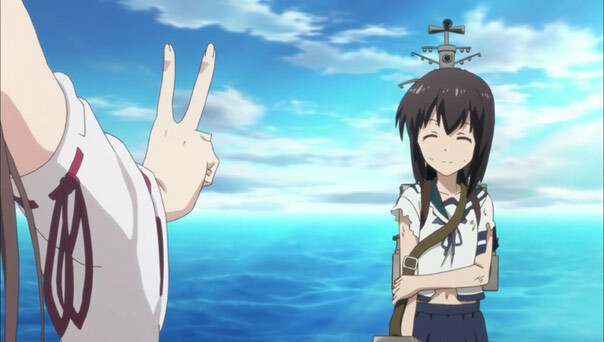 Fubuki’s first impression of Kongou was of a cool, steely fleet maiden…an impression shattered by the reality that Kongou is a bit of a goofball, whose hyper antics are not only tolerated but admired by her sisters. 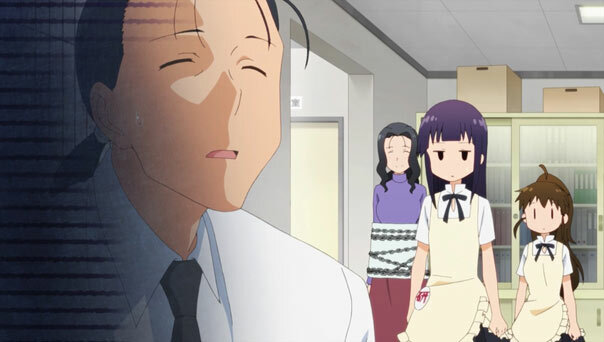 All four sisters are voiced by the similarly hyper Touyama Nao., mixing four different delivery systems quite well. If she’s having these conversations with herself in real time in the recording studio, well, all I can say is kudos. 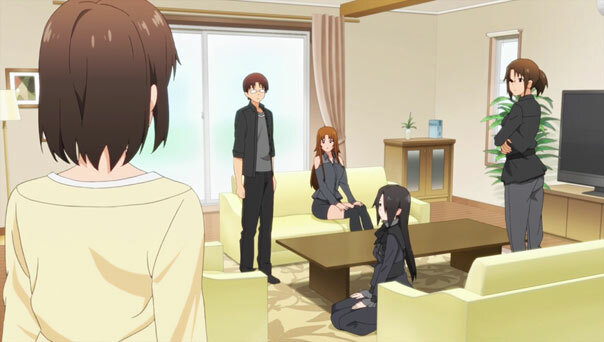 The bubbly Kongous are a stark contrast to the mood in Fubuki’s dorm, with Mutsuki first out and last in, and Fubuki and Yuudachi unable to broach the subject of Kisaragi, and Mutsuki unwilling to let them. 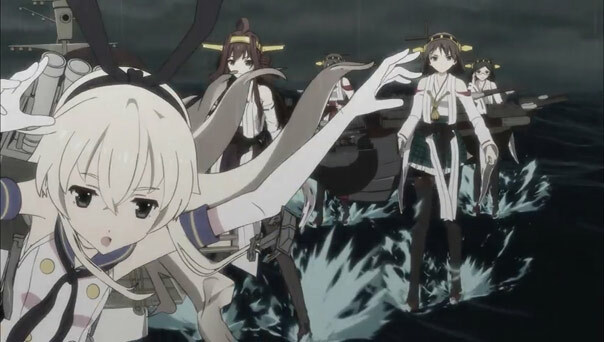 The road to the next battle also hits a bit of a detour that’s played for laughs, with the Kongou sisters coming up with increasingly ridiculous attempts to draw out the eccentric Shimakaze (In the end, tea and scones do the trick). Personally, I wasn’t really in the mood for such levity and was hoping for a prompter, more solemn shoving-off. 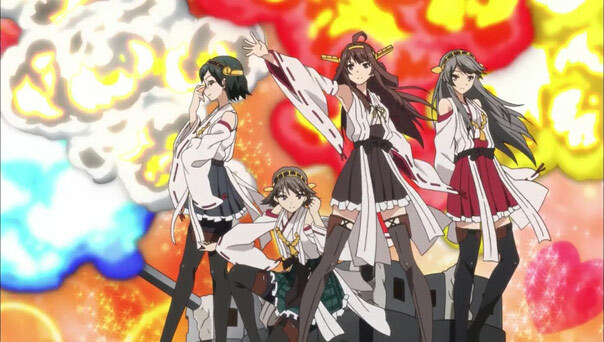 Still, it makes sense that the Kongou sisters are more laid back when it comes to imminent battles. They’ve been in lots, they have big guns, and most importantly, they have each other. The fleet’s disposition is, well, fleet, as in fast. With big storms in the battle area, the fleet carriers won’t be as much use as the fast battleships and faster destroyers that can swoop in, hit hard, and swoop out, regardless of weather. 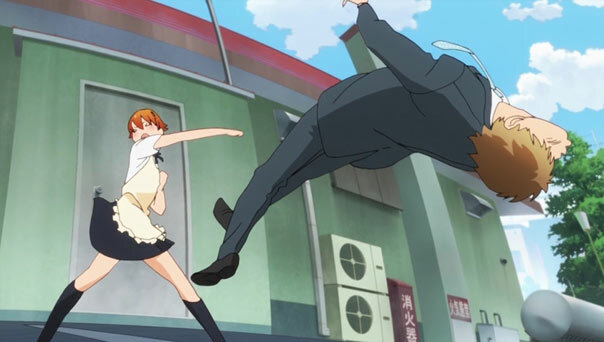 The show is keen to let us know that Shimakaze isn’t just fast (her namesake made 47 knots) but wears a g-string under her wisp of a skirt, in a bit of fairly shameless, if quick, Vividred-style fanservice. 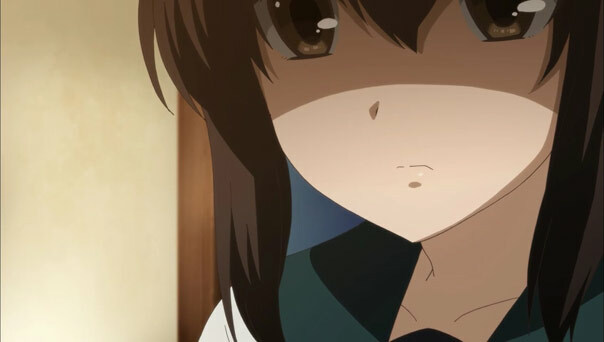 When the battle with the two Abyssal battleships commences, Fubuki ends up further out than she should be and is pinned down and her turret damaged. 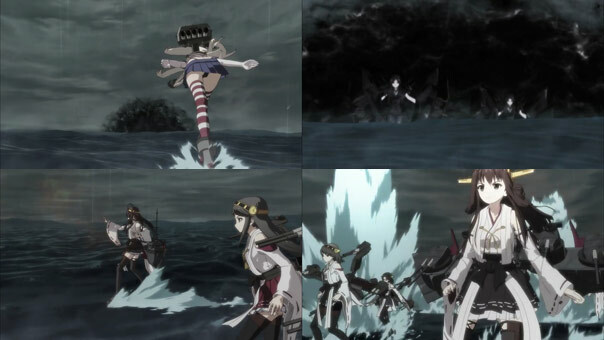 In a moment of fear (and worry about Mutsuki back home), she freezes up, but once again Kongou saves her, deflecting the enemy shell with her bare fist in a badass display, and showing Fubuki that cool, steely fleet maiden she first encountered. Kongou may not be the most serious or composed person off-duty, but she gets the job done out in the field, as do her sisters. 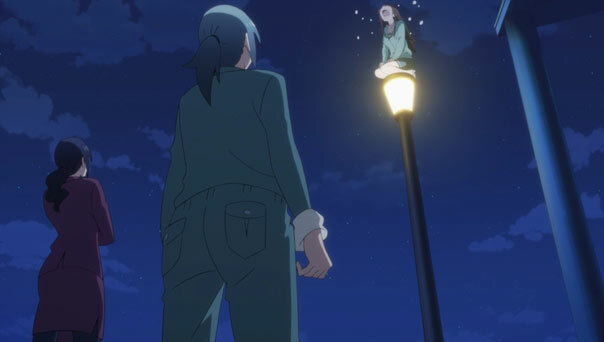 Thanks to her, Fubuki is able to escape another brush with destruction and make it back home. 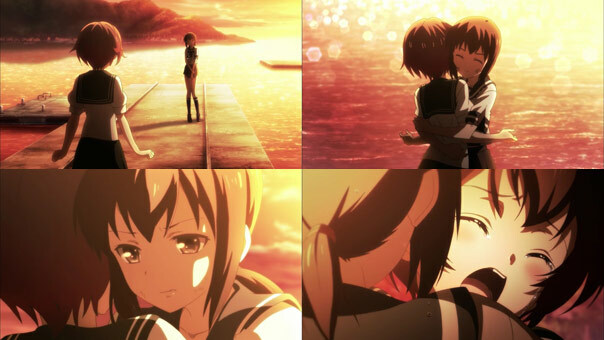 She greets Mutsuki on the wharf at sundown and gathers her in a hug, and doesn’t let her go until Mutsuki lets it all out, which in turn causes her to let it all out. 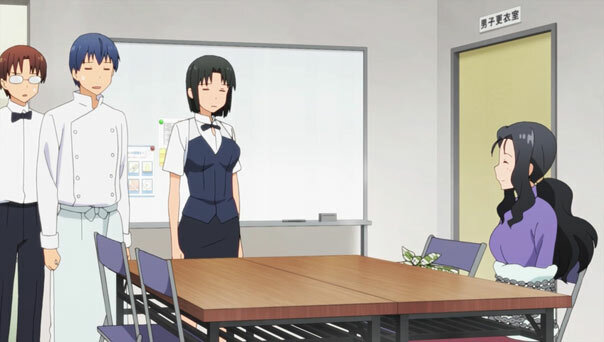 It’s an touching, cathartic moment the episode had been steadily building up to, and I felt it was earned. 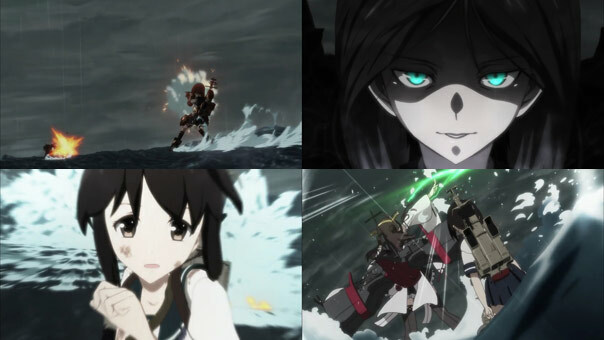 KanColle’s first two episodes lacked emotional resonance, but the last two have more than made up for it.